I sing in Chalmers sångkör. Information about upcoming concerts on the choir homepage. Choir of the Ostrobothnian nation at the University of Helsinki. I was the chair for 1.5 years before I ran away to Sweden. 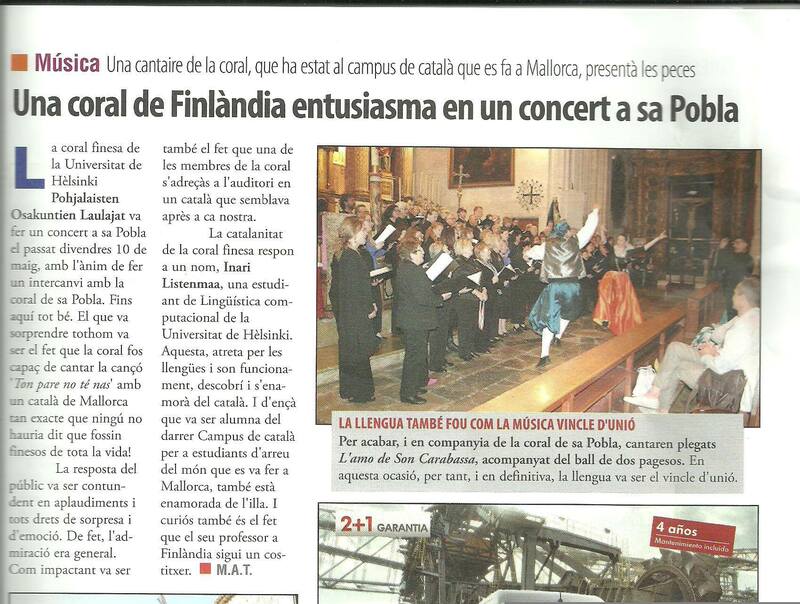 The picture below is from our choir trip to Mallorca in 2013. I've written and arranged some songs for choir. Diga Janeta, SATB. Folk song from Provence. Recording by some nice people in Chalmers sångkör. Bogoroditse devo, SSA. Original song "The Descent" by Niburta. Härlig är basen, BBBB. What do you get if you put together the bass parts of 4 different arrangements of Härlig är jorden. A caelo cadent homines, SATB. Based on the arrangement by Claes Grufman. It's raining men translated into Latin and made into church music, sort of. Recording by people in Chalmers sångkör.